Maintaining a threat-free network requires much more than just securing your domains with SSL certificates. For organizations that deal with a large SSL environment, the process of purchasing, deploying and renewing SSL certificates often proves to be cumbersome, time-consuming and has hardly been straightforward. Oversight, manual errors, improper configuration, weak ciphers, and expiration often lead to downtimes, compliance issues and security breaches. Certificate life-cycle management is a practice that streamlines certificate management process by automating acquisition, issue, deployment, re-issue, renewal and revoking of certificates. Password Manager Pro facilitates end-to-end certificate life-cycle management for your public facing websites by integrating with the renowned open Certificate Authority, Let's Encrypt. This means you can procure domain validated certificates from Let's Encrypt for your public domains, deploy, track, request alerts on expiry, renew certificates; everything done entirely from the product interface. 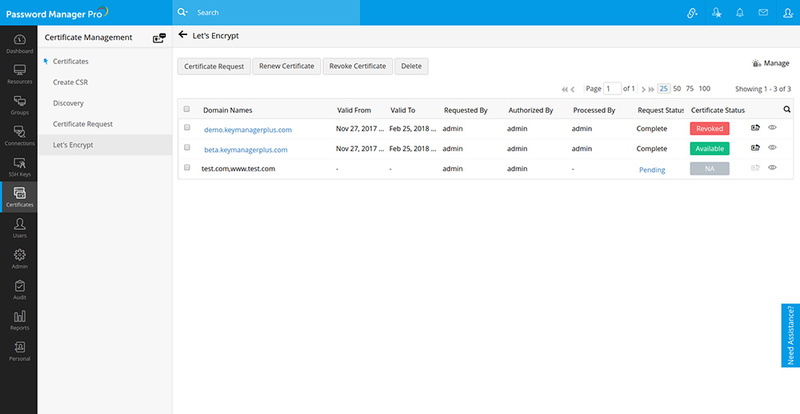 You can request, procure, deploy, monitor, track and renew certificates from Let's Encrypt CA directly from Password Manager Pro interface. The first step in requesting for certificates from Let's Encrypt CA is creating an account with Let's Encrypt. This is a one-time process and can be done from Password Manager Pro interface itself. Navigate to Certificates >> Let's Encrypt >> Manage. Under Account tab, click New Registration. In the UI that opens, provide an account name and specify a valid email address. Accept the Let's Encrypt Subscriber Agreement by enabling the check-box. An account with Let's Encrypt is created. Note: This privilege is available for only the administrator users and only one Let's Encrypt account can be created from Password Manager Pro. 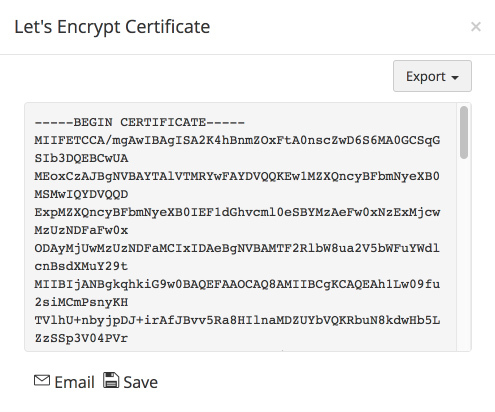 After creating an account with Let's Encrypt, you have to generate a certificate request. You are then presented with a challenge which you have to fulfill for Let's Encrypt to validate your domain and issue the certificate. Navigate to Certificate >> Let's Encrypt >> Certificate Request. Fill in the domain name, choose the key algorithm, algorithm length, signature algorithm, keystore type, enter the keystore password and click Create. 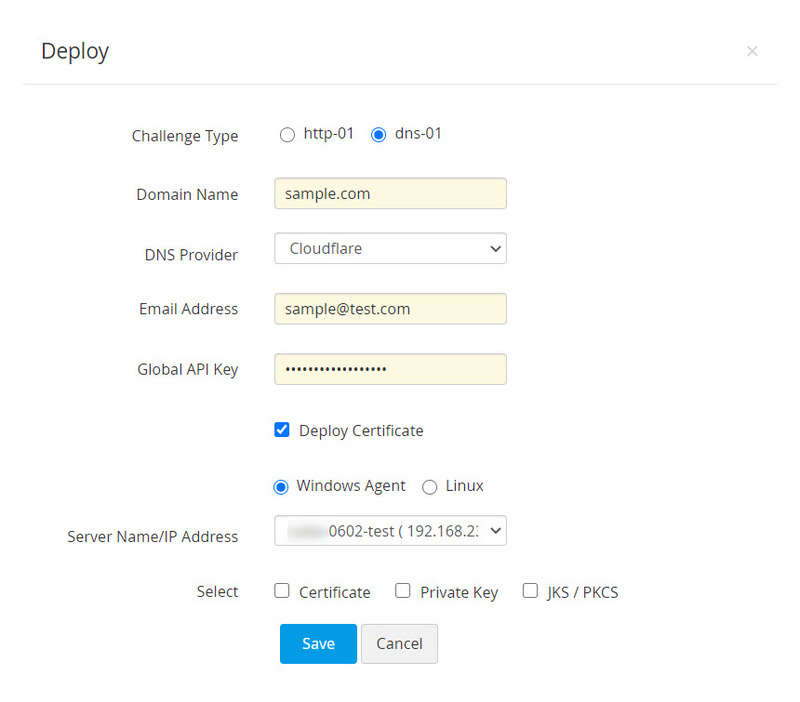 For dns-01 challenge type, you can choose and assign a DNS account from the dropdown if you have already configured your DNS credentials. This will be used for automatic challenge verification for all the domains specified in the request. Also, you have options to change the private key whenever the certificate is renewed. If you need to change the key, use New Key. This option will generate a new key every time the certificate is renewed. If you want to retain the same key on renewal, use the Same Key option. To use your own key, use the Import Key option. This key will be used for the first time when the certificate is generated and also for subsequent renewals. Navigate to Let's Encrypt >> Manage. Switch to the DNS tab. Here, you can add a maximum of one DNS account for each DNS provider supported. Password Manager Pro currently supports automatic challenge verification for Azure and Cloudflare DNS. Click Add. In the pop-up that opens, choose the DNS provider. 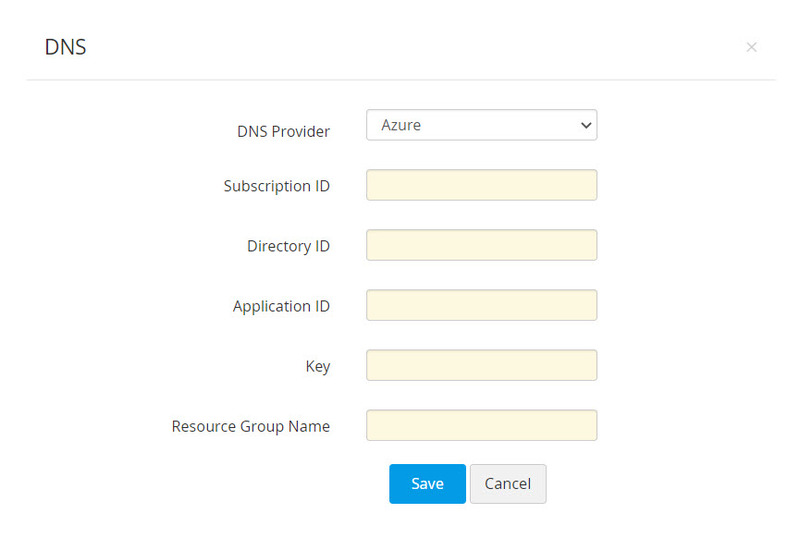 Provide the Subscription ID, which is available in the Overview page of the Azure DNS zone. Provide the Directory ID, which is available in Azure Active Directory >> Properties. If you have an already existing Azure application, provide its Application ID and Key. If not, follow the steps mentioned below to create the Azure application and key, and give the application access to the DNS zones for making API calls. Navigate to App registrations >> New application registration. Provide the application name, select the application type Web app / API and provide the sign-on URL. Click Create. After successful creation, you are directed to a window that displays the Application ID. To get the application key, navigate to Keys and create a key. Provide the key description, duration and click Save. Once the key is saved, key value is displayed. Copy and save the key value for future references. Navigate to the resource group where all DNS zones or created or switch to a specific DNS zone. Switch to Access Control (IAM) and click Add. Choose the role as Contributor, assign access to Azure AD user, group or application, search and select the application created in Azure Directory and click Save. The created Azure application is now given access to DNS zones for making API calls. Finally, enter the Resource Group Name, which is the group name in which you have created the DNS zone and click Save. Your DNS account details are saved and listed under Manage >> DNS. In the Email address field, specify the email address associated with the Cloudflare account. For Global API Key, use the 'Generate API' key option in the domain overview page of the Cloudflare DNS to generate the key and paste the value in this field. Click Save. Your DNS account details are saved and listed under Manage >> DNS. One certificate can secure up to 100 domains. You can enter a maximum of 100 names in the 'domain name' field out of which the first name is considered as the common name and the rest are treated as Subject Alternative Names (SAN). Password Manager Pro supports http-01 and dns-01 based domain validations. Choose the challenge type based on your requirements. For dns-01 based domain validation, if you are using your configured DNS account for challenge verification, make sure that the status of the chosen DNS account is marked Enabled under Manage → DNS. Option to change the private key currently works only with the RSA key algorithm. Password Manager Pro expedites domain validation through automatic verification of HTTP-01 and DNS-01 challenges (currently Azure and Cloudflare DNS). For the automation to take effect, you have to initially map the end-server details to Password Manager Pro, which is a one-time process. A window opens displaying the challenge to be fulfilled. Click the Agent mapping icon(). A pop up will open. If the domain server is a Linux machine, fill in the required details and click Save. Navigate to Certificates >> Let's Encrypt tab, and click Manage button in the top right corner. Switch to the Windows Agents tab. Download the Password Manager Pro agent from the top right corner of the window based on your server compatibility (32 bit or 64 bit). Open the command prompt and navigate to the Password Manager Pro installation directory. If the domain server is a Windows machine, download and install the Windows agent on the domain server. Navigate to Manage >> Windows Agents, download and install the agent on the domain server. Once, the above agent mapping settings are configured (agent mapping is a one-time configuration), Password Manager Pro automatically handles the verification of challenges presented by Let's Encrypt. After configuring agent mapping, click Pending on the pending requests and click Verify. The challenge is verified and the certificate request is submitted to Let's Encrypt CA. Switch to Let's Encrypt tab and click on the request status (Pending) corresponding to the certificate request. You'll be directed to a window that displays the DNS challenge value and TXT record. If you have already configured your DNS account details and have opted for DNS while creating the certificate request, you can assign the DNS account to the request. Select the request, choose Assign DNS from More top menu and select the required DNS account. In cases where you do not have a DNS account configured or have not opted for it when raising the certificate request, Password Manager Pro provides an option for automating DNS-01 challenge verification through Agent Mapping. Click on the Agent Mapping icon present to the left side of the request. Agent mapping is a one-time configuration. In the Deploy window that opens, carry out the following operations to map and save your end-server details in Password Manager Pro. Choose your DNS provider. For Azure DNS, provide the required details—subscription ID, directory ID, application ID, application key and resource group name. For Cloudflare DNS, enter the email address associated with your Cloudflare account and the Global API key. 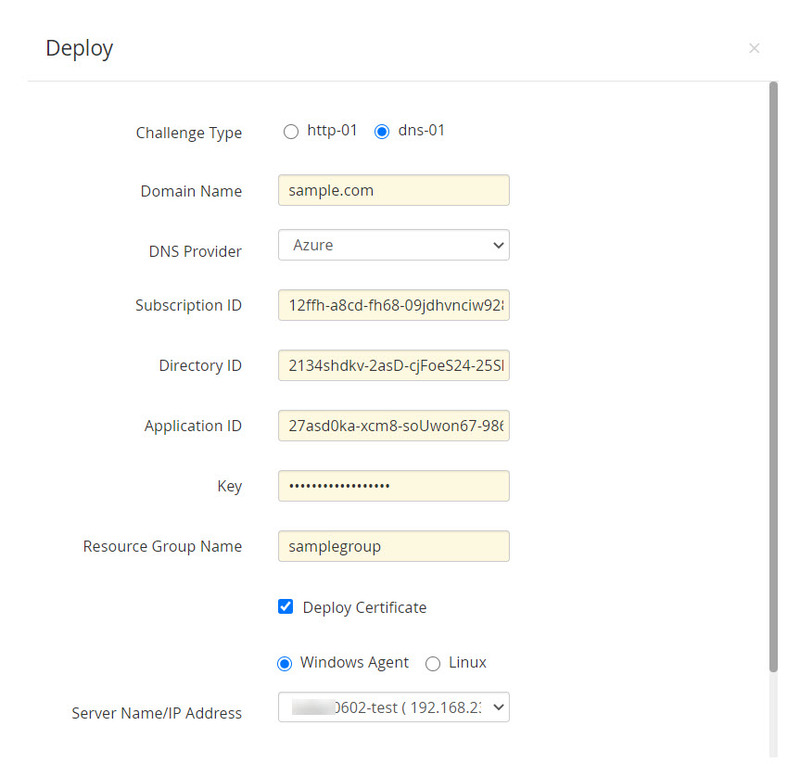 Enable the Deploy Certificate check-box to automate deployment of the certificate to their corresponding end-servers after domain validation and after successive renewals. For Linux end-servers provide the required details, while for Windows end-servers download and install the Windows agent using the same procedure as mentioned for http-01 challenge. After filling in the details, click Save. The end-server details are successfully mapped and stored in Password Manager Pro, which you can view or edit from Manage >> Deploy tab. You can request and acquire certificates only for public domains using Let's Encrypt integration. The handling of challenges can also be done manually without automation. Copy and paste the challenge values / text records manually in your domain server. Then in the Password Manager Pro server, navigate to Pending Requests page and click Verify. The challenge is verified and certificate is issued. Password Manager Pro automates challenge verification using DNS for a certificate request only when Agent mapping is not available. Challenge verification is automated through agents, if agent details are available in Manage → Deploy tab. Currently, Password Manager Pro agents are only available for Windows servers. On successful verification, Let's Encrypt issues the requested certificate. The window automatically redirects to a page which displays the certificate and its status (status is marked Available, if the challenge verification is successful and Failed if the challenge verification fails). Click the Available button to save the certificate in Password Manager Pro repository, e-mail or export it. If the challenge fails, click New challenge( ) to obtain another set of challenges and repeat the above process. On saving, the certificate gets added to the Password Manager Pro repository which can be viewed from the Certificates → Certificates tab. Certificates issued by Let's Encrypt have a life-time of ninety days after which they are not valid. Also, as mentioned above, the domain authentication validity period is sixty days, which means that the user has to fulfill the challenges once in every sixty days in order to prove his ownership of the domain. The certificate is renewed and the Certificate Status bar displays Renewed. History on renewal can be inferred by clicking on the certificate history() button from the Certificates → Certificates tab. Note: The certificate should be saved after renewal in order to be updated in the certificate repository. Else, only the old version of the certificate will continue to remain in repository. If agent mapping had been configured, the certificate renewal process is done automatically without manual intervention. All the certificates in your organization procured from Let's Encrypt is automatically renewed after every 75 days. i.e., 15 days before its expiry and a notification is sent to the account holder's e-mail address. Note: Automatic renewals are applicable only for those certificates saved in Password Manager Pro repository. i.e., after procuring a certificate from Let's Encrypt, you have to save it in order for the automatic renewal to take effect. Revoking a certificate renders the certificate invalid and immediately removes the HTTPS from the website. The certificate is revoked and is no longer valid. Deleting a certificate removes the certificate from Password Manager Pro repository, but the certificate still remains valid. The certificate is deleted from the PMP database.